There was a big celebration on Binghamton University's Campus Sunday and it wasn't your average college party. Together, seven BU students celebrated a major milestone in their life. Students at Binghamton University freeze on the Lois DeFleur Walkway of campus promoting Shabbat 1500 uniting Jewish students through a mega Shabbat celebration. At Binghamton we don't mess around. Even when school is out for Purim, the Purim Carnival is still one of the hugest events on our campus. This year, the 20th annual carnival was held in the event center with more attractions and rides than ever before. Everyone agreed it was awesome: the food, music, contests and fabulous prize drawings. Best of all? charity was raised to distribute to important charities including the rescue and rebuilding efforts in Japan. In an afternoon celebration of deep meaning, passion and joy, four Binghamton University students celebrated their Bar/Bat Mitzvahs at Chabad's first annual Bar/Bat Mitzvah Bash. Emily Mydosh, Mikell Senger, Anna Bitterbaum and Dan Lazrus each spoke movingly, giving personal context and dimension to their celebration of this rite of passage at this age. A lavish meal, spirited dancing and fun atmosphere made this an unforgettable affair. Chabad is currently accepting applications from BU students who wish to similarly celebrate their Bar/Bat Mitzvahs in the celebration to be held in Fall of 2011. Binghamton students are big hearted. They celebrated Chanukah in unique fashion by lighting up the lives of hundreds of children with cancer. Through the Chai Lifeline Ny Based organization, who were the ecstatic recipients of toys collected for their pleasure. Over $6,000 worth of toys were collected in the drive spearheaded by Chabad , SAE and SDT and co-sponsored by Greek groups: ΑΚΨ , АФ, АΣФ, AZD, ΔΧ, ΦAΔ, TEФ, ZBT and ΧΦ. The event featured the kindling of a one of a kind Menorah in which the toys were displayed, a performance by the Crosbys and delicious treats for all. Binghamton University college students give back while celebrating the Hanukkah season. In celebration of the sixth day of Hanukah, Binghamton University students are lighting a special kind of menorah. A ten foot tall menorah filled with donated toys in big plastic tubes was lit at B.U. tonight. A large group of students gathered to sing and hear a popular on-campus acappella, The Crosby's, group perform. Experience the exuberance and emotion of (an almost) real Jewish wedding held at the Chabad Center for Jewish Student Life at Binghamton University on November 18, 2010. There's no better way to learn! 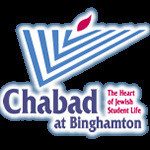 Chabad at Binghamton 25th Anniversary Gala Dinner Introductory Video Presentation.